Dementia, stroke, multiple sclerosis: Munich researchers are uncovering the shared mechanisms that underlie diverse neurological disorders in a search for new therapeutic strategies. Nowadays, Haass and his Munich colleagues are no longer unaware of the crucial contribution of immunological mechanisms to the progression of dementia. Indeed, much of the work done by the Cluster of Excellence SyNergy – funding for which has now been extended – has underlined their importance. Over a period of several decades, a cascade of physiological and pathological processes leads to the accumulation of characteristic protein aggregates called plaques, and to the progressive loss of nerve cells, in the brain. Researchers now know that inflammation reactions trigger the activation of the microglia. To complicate things further, the phagocytes in the central nervous system play a dual role in this context. They promote progression of the disease, but in its early stages their activation has a protective effect. “In the initial phase, the microglia help to restrict the size of the plaques, thus preventing nerve-cell death,” says Haass, who holds a Chair in Metabolic Chemistry at LMU and is Coordinator of the Munich Site of the German Center for Neurodegenerative Diseases (DZNE). That Haass did not follow up his early work on inflammation processes should not be held against him. Little was then known about the origin of neural plaques, and the necessary technologies were still lacking. Focusing on the most striking aspect of a disorder is the normal first line of attack, in accordance with the conventional principle of categorizing pathologies on the basis of their most distinctive features. The fact that this approach does not go far enough in this case explains why the concept behind the SyNergy Cluster was so appealing. The idea was to look for parallels between the pathogenic mechanisms underlying common neurological disorders, instead of focusing on the differences in their specific manifestations. Dementia, stroke and multiple sclerosis are unfortunately very common and, as the work of the SyNergy Cluster has since shown, they all result from interactions between degenerative, immunological and vascular pathologies. The hope is that this fundamental insight will lead to a better understanding of the factors causally associated with these diseases, and point the way to more effective treatments. The Excellence Cluster SyNergy (short for Munich Cluster for Systems Neurology) is the fruit of a joint initiative between LMU and the Technical University of Munich (TUM), and includes the two University Medical Centers in the city, as well as the Helmholtz Zentrum München, the German Center for Neurodegenerative Diseases (DZNE), and the Max Planck Institutes for Biochemistry, Neurobiology and Psychiatry. The SyNergy concept was approved for funding in the second phase of the Excellence Initiative in 2012 and has been in existence for 5 years. It has now successfully come through the selection procedure for the new Excellence Strategy. “The basic idea is sound, and after 5 years, there is still a lot to be done,” says Haass. For the network of pathophysiological similarities that has come to light turns out to be densely woven. Along with the crucial role of neuroinflammation, vascular dysfunction contributes to dementias. Abnormal protein deposits – a typical feature of damaged nerve cells – are also found on the walls of the blood vessels that feed these cells. “The deposits eventually lead to obstruction of the vessels, to localized bleeding and to characteristic changes in gene expression in the endothelial cells that line the blood vessels.” Furthermore, the autoimmune disease multiple sclerosis is not, as had long been thought, a purely neuroinflammatory disorder, it also causes substantial losses of nerve cells and neuronal functions. “And toxic processes like those seen in Alzheimer’s are very probably involved,” says Haass. Stroke too turns out to encompass far more than a localized obstruction of cerebral blood flow. It also triggers local and systemic alterations in the immune system with consequent damage to nerve cells and neurological functions. “Stroke patients often present with dementia, or have a higher risk of developing Alzheimer’s,” Haass notes. Observations like these confront SyNergy’s researchers with new transdisciplinary problems that transcend the conventional classifications of these diseases. To tackle these problems, Alzheimer experts are working with MS specialists, and researchers who focus on neurodegenerative mechanisms collaborate with those whose work centers on the vasculature. Eleven new projects have already been planned, and in two further rounds of internal competition, an equal number of proposals for such tandem projects will be chosen. One of the latter relates to the role of the mitochondria, the cell’s power stations, in Parkinson’s disease, amyotrophic lateral sclerosis (ALS) and multiple sclerosis. All three conditions are characterized by the degeneration of the axons (the long projecting fibers) of nerve cells. The question here is how do the mitochondria in nerve cells and microglia react to axonal loss? To find the answer, SyNergy members plan to study gene expression profiles and use novel imaging techniques to follow the fate of the mitochondria. “The involvement of essential intracellular components such as the mitochondria across the whole spectrum of neurological disorders underlines the continuing relevance of basic research for the Cluster’s conceptual structure,” says Thomas Misgeld. 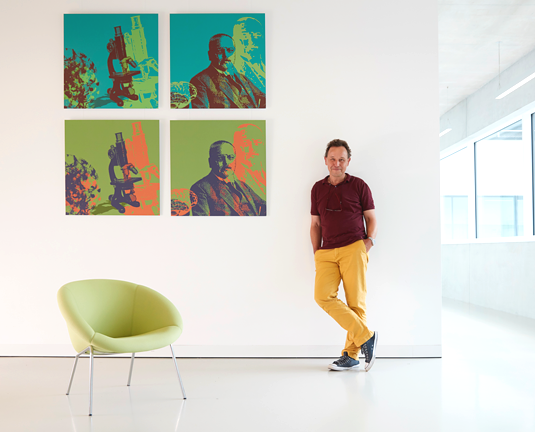 Misgeld holds a Chair in the Cell Biology of the Nervous System at the TUM and serves as Coordinator of the SyNergy Cluster, together with Haass. The hallmark of MS is the local destruction of the myelin sheath, a fat-rich membrane that insulates long axons and promotes rapid transmission of nerve impulses. Failure to replace the sheath is apparently due in part to a defect in phagocytes: They are unable to activate specific metabolic pathways which are required for the uptake and degradation of myelin lipids, and this in turn leads to the build-up of fatty deposits. Strikingly, a very similar phenomenon is observed in the case of atherosclerosis. SyNergy researchers hope to clarify the reasons for this in another tandem project. The transdisciplinary tandem model certainly stimulates productivity and enhances understanding, as demonstrated in the approximately 900 papers the Cluster have produced over the past 5 years – most of which appeared in highly regarded journals. Notably, the number of collaborative papers authored by researchers from LMU and TUM in this field has risen rapidly since the inception of the Cluster. SyNergy participants also played a major role in the establishment of a common “Center for Stroke and Dementia Research” on the Hightech-Campus in Grosshadern/Martinsried. This hosts a number of research groups involved in the Cluster, but it also gives them access to patients, and thus provides direct links to clinical research. It is hoped that a second such SyNergy Research Center, devoted to Neuroinflammation and Neurosciences, can be set up during the lifetime of the present Cluster. “We want to ensure that the insights we have gained from basic research are rapidly translated into clinical practice,” says Haass. This explains why translational research will play a larger role in the Cluster’s new lease of life. While the first five years were dedicated to exploring the viability of SyNergy’s research concept, the participating researchers will now focus more on the development and verification of new therapeutic concepts. Some of the research tandems will also concentrate specifically on translational issues. Haass himself is involved in a project designed to identify biomarkers that reveal the activation of microglia and develop them for use in clinical practice. These indicators will give researchers a better understanding of the impact of inflammation processes on the progression of Alzheimer‘s and other forms of dementia. Informative biomarkers should also permit earlier diagnosis – and provide ways of monitoring the effects of interventions designed to target phagocytes. Microglia are normally in a resting state, but once they detect the presence of plaques or other signs of neuronal damage, they go into action in an effort to degrade the toxic deposits. The activation process involves changes in gene expression and metabolism that increase the mobility and efficacy of the cells. Haass is particularly interested in the gene TREM2. In the absence of its protein product, microglia cannot be fully activated. His team is working on the design of antibodies that recognize TREM2 on the microglial surface and trigger the uptake and degradation of plaques. Antibodies could also be used to probe the functional status of TREM2, which might serve as a marker for early signs of dementia. These ideas will be tested in a mouse model and, if they succeed, clinical trials can be initiated in humans. And in fact these antibodies will not only be tested for their therapeutic potential in Alzheimer's disease but similarly also in Multiple Sclerosis – a classical SyNergy approach. Mononuclear phagocytes can both promote and inhibit inflammation. An LMU team has now shown that individual phagocytes in the central nervous system can play both roles, sequentially adopting different phenotypes with distinct functions. LMU researchers have characterized the mechanism that initiates the pathological aggregation of the protein FUS, which plays a central role in two distinct neurodegenerative diseases. The role of microglial cells in neurodegenerative disease is not fully understood. But new results from researchers in Munich and Basel suggest that stimulation of this arm of the immune system might well delay the onset of such disorders. Signal molecules called chemokines often work in tandem to recruit specific sets of immune cells to sites of tissue damage. A systematic analysis of their interactions by LMU researchers pinpoints potential targets for new therapies. Alois Alzheimer, who first described what has become the most common form of dementia, died 100 years ago. What is known about the illness today and, above all, what can be done about it? LMU’s Christian Haass gives us a tour d’horizon. Unrestrained immune reactions promote atherosclerosis. Clinical researcher Christian Weber is studying the web of molecular decisions that lead to this misdirected and potentially fatal response.